Hillary Clinton continues to gain ground in our presidential forecast, as it becomes clearer that last week’s debate was a turning point in the race. In fact, the polls we added to our database on Tuesday may have been Donald Trump’s worst since the debate. They included surveys showing Clinton leading Trump by 9 percentage points and 10 points in Pennsylvania, by 6 points and 2 points in North Carolina, and by 3 points in Nevada. These polls contribute to an impressive streak for Clinton, who has trailed in just one of 25 swing state polls conducted since the debate. Her chances of winning the election are up to 75 percent in our polls-only model, her best position since Aug. 30, and 71 percent in our polls-plus model. Those forecasts assume that Clinton currently leads Trump by slightly more than 4 percentage points nationally, which may be on the conservative side as Clinton’s lead has tended to grow as additional post-debate polls have been added to the model. One particular area of concern for Trump is North Carolina, where the polls we added on Tuesday were the fourth and fifth since the debate to show Clinton ahead there. They also had favorable trend lines for Clinton, with SurveyUSA showing her with a 2-point lead rather than a 4-point deficit in their early August poll, and Elon University showing her up by 6, instead of down by 1 point in their mid-September poll. North Carolina is not a state where you want to be trailing in the polls in October, hoping for a late comeback.1 That’s because it typically has high rates of early and absentee voting. In 2012, for example, about 60 percent of ballots in North Carolina were cast before Election Day. Absentee voting is already underway there, while in-person early voting begins on Oct. 20. Our forecast models, which don’t make any specific assumptions about early voting,2 see North Carolina as being important for another reason. Namely, because of the state’s demographics, it acts as a potential hedge for Clinton in the event of a collapse in her support among white voters without college degrees, especially in the Midwest. That’s why our models show North Carolina as the fourth-most important state, ahead of more heralded ones such as Ohio and Colorado. To back up for a moment, one of the most important features of a presidential forecast is how it handles correlations between states. Take a hypothetical example of an election between the candidates Kang and Kodos, in which Kang has 268 electoral votes locked up, Kodos has 263, and it all comes down to Rhode Island and Delaware. Kodos must win both Rhode Island and Delaware in order to be elected president. If Kodos’s chances are 50 percent in each state, then what are his chances overall? If the vote in Rhode Island is completely independent from the vote in Delaware, Kodos needs to win the equivalent of two coin flips, and his chances are 25 percent. If they always vote together — as goes Rhode Island, so goes Delaware — Kodos will either win both states or lose both, and so his chances are 50 percent. And if they’re perfectly anticorrelated — Rhode Island hates Delaware’s guts, and always votes the opposite of Delaware just to prove the point — Kodos can’t win both states and his chances are zero. We’ve spent a lot of time exploring this question at FiveThirtyEight. And the empirical answer is closest to No. 2, with No. 1 being the runner-up. That is, the states are positively, but not perfectly, correlated with one another. This ought to be fairly intuitive. If on Nov. 8, you learn that Trump has won Wisconsin despite having been behind in the polls there, you should assume it’s more likely than not that Trump has beaten his polls elsewhere, but especially in states that are demographically similar to Wisconsin, such as Michigan and Minnesota. An important feature of this correlation is that it helps the trailing candidate’s chances. Say that by Election Day, Trump isn’t quite dead in the water, but Clinton has Pennsylvania, Colorado and most of her “firewall” states locked up. Trump has to win each of five remaining tossup states — New Hampshire, Florida, North Carolina, Nevada and Ohio — in order to become president, with 50 percent chances in each one. This is just like the Kang and Kodos example. If you imagine these states as being five independent coin flips, Trump’s odds are really long — just 1 chance in 32 that all five coins come up heads for him. But if the coins are perfectly correlated with one another — maybe there’s some master coin that moves all five states together, and all he needs to do is for that one coin to come up heads — his odds are 1 in 2. (Deep breath.) OK, back to North Carolina. 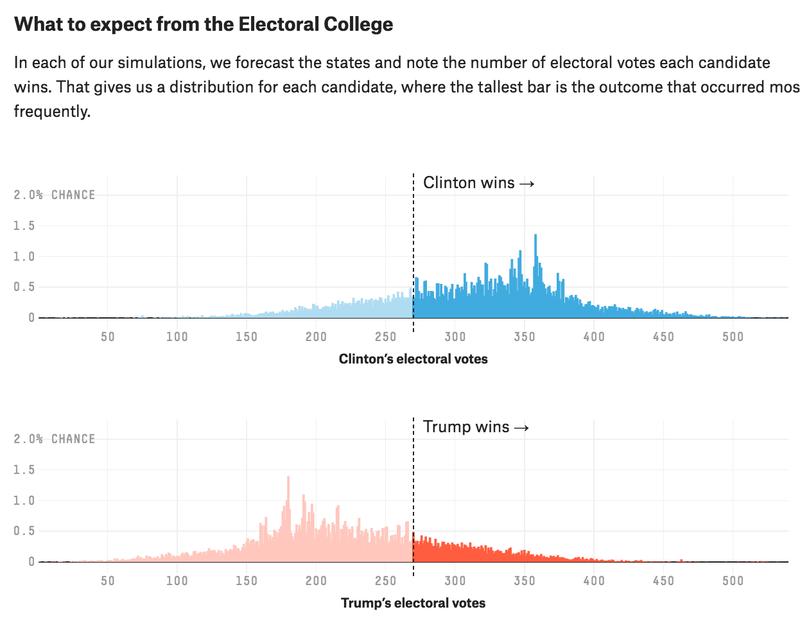 As I just mentioned, correlation is a risk to Clinton because it allows Trump to win by the “master coin” scenario in which all of the swing states move in the same direction. So she would rather have a diverse group of swing states that are less correlated with one another and less likely to move together. North Carolina serves that purpose, because it’s a little different than most of the other swing states. Its mix of voters — a combination of college-educated whites (and college students) in Charlotte and the Research Triangle, African-Americans, and often very conservative white evangelicals elsewhere in the state — is distinctive. 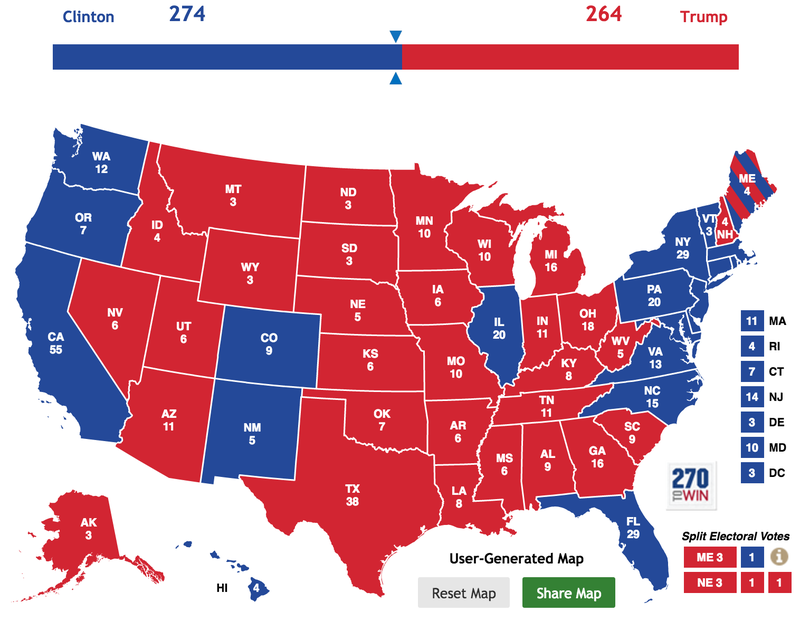 All right, it fairly closely resembles Virginia and Georgia, although both are barely even swing states at the moment.3. But it isn’t similar to Midwestern states such as Michigan and Wisconsin, which have a far higher proportion of white voters without a college degree. This is particularly true if you also consider religion: the noncollege whites in North Carolina tend to be evangelicals, whereas the Midwest has a lot of groups like middle-class white Catholics. 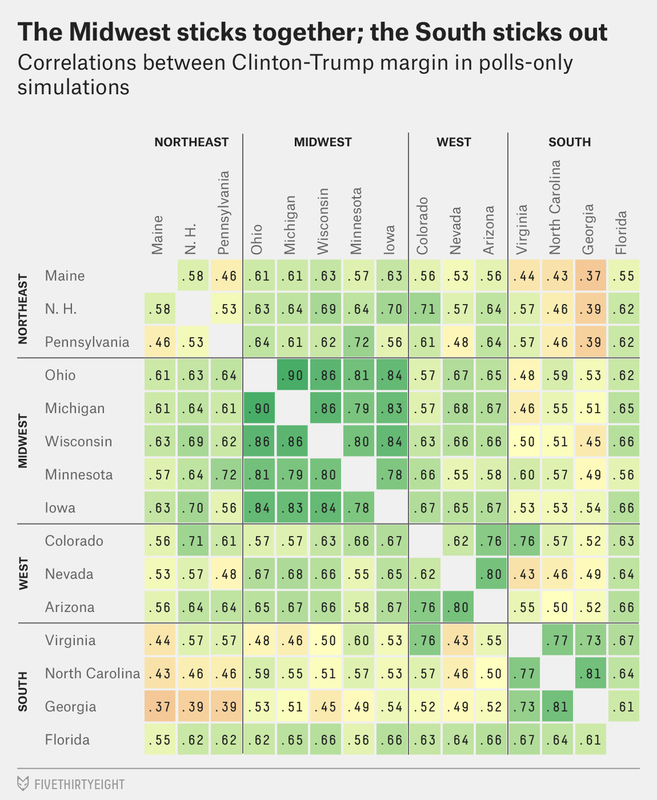 As you can see in the chart, the model assumes that all states’ outcomes are positively correlated. But some are much more correlated than others. In particular, the Midwestern swing states are liable to behave similarly to one another. There are other interesting correlations too — for example, Colorado and Virginia are highly correlated because of their education levels, while Arizona and Nevada are correlated based on their religious and racial makeup. But these don’t have much impact because those states don’t have as much electoral oomph as the five Midwestern states, which together have 60 electoral votes. It’s fun to consider which of these maps are plausible and which ones aren’t — and that’s basically what our model spends its time doing. The result of all those extra CPU cycles is that North Carolina turns out to be a bit more important than you might think — bad news for Trump given the recent polling there. Although, we’d urge some caution: Most early voters are committed partisans, rather than swing voters who might change their minds at the last minute. Maybe something we’ll add to the model for 2020? Virginia has moved strongly to Clinton, and Trump would probably lose Georgia only in a landslide. Gender and age are also dividing lines, but the ratio of men to women, and older voters to younger ones, doesn’t vary much from state to state, and so it doesn’t affect these correlations.